In three blog posts we explained how the UBS Willow Fund’s decision to make a large, highly-leveraged short bet on credit risk contrary to its repeated SEC disclosures caused investors to lose over $200 million between 2007 and 2012 . See Credit Default Swaps on Steroids: UBS’s Willow Fund, Willow Fund’s Hedging, Investing and Speculating in Distressed Debt With Credit Default Swaps and Further Reckoning of UBS Willow Fund’s CDS Losses. As we demonstrated in our earlier blog posts, the second half of 2007 was when the Willow Fund began taking larger and larger short bets and paying ever larger CDS premiums. Up to and including the June 30, 2007 N-CSR the Willow Fund’s annual and semi-annual reports list the CDS premiums it paid as an expense item “Interest on credit swaps”. Reporting the periodic payments as an expense allowed investors to see how much the Fund was paying to bet against the credit of certain issuers. Although there is some ambiguity about tax rules on swap contracts it is clear that the periodic payments made by the protection buyer – the Willow Fund in this case – should be expensed in the period they are paid. * We’ve estimated the Fund’s “Interest on credit swap” expense for each year and find our numbers closely track the Willow Fund’s reporting up to June 30, 2007 after which the Fund stopped reporting this expense item and buried it in the change in market value of securities it held or had disposed of. The accrued expense related to the periodic payments is reflected as interest on credit swaps in the Statement of Operations. The accrued expense related to the periodic payments on credit default swaps is reflected as realized and unrealized loss in the Statement of Operations. This CDS expense skyrocketed after the Willow Fund stopped reporting it. We estimate that the Fund paid over $20 million per year on average in CDS premiums from 2008 to 2012. By changing how it reported this item from an expense to a change in the market value of the securities it held or had sold the Willow fund was able to mislead investors. Here is the $2,562,680 line item in expense for “Interest on Credit Swaps” in the 2003 C-NSR. 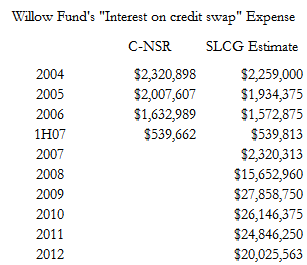 Here is the $2,320,898 line item “Interest on Credit Swaps” in the 2004 C-NSR. Here is the $2,007,607 line item “Interest on Credit Swaps” in the 2005 C-NSR. Here is the $1,632,989 line item “Interest on Credit Swaps” in the 2006 C-NSR. And finally the $539,662 “Interest on credit swaps” expense item in the June 2007 C-NSR. But it is gone from the 2007 C-NSR. Excellent. I wonder if anyone has done more extensive research on funds and companies that did the same thing.